Home » Cover Story » The North-South Fertility And Finance Battle: Will South India Lose Out? The North-South Fertility And Finance Battle: Will South India Lose Out? I read this article and found it very interesting, thought it might be something for you. The article is called The North-South Fertility And Finance Battle: Will South India Lose Out? and is located at https://archive.indiaspend.com/cover-story/the-north-south-fertility-and-finance-battle-will-south-india-lose-out-65488. Mumbai: As leaders of south Indian states raise concerns over the terms of reference for the 15th Finance Commission alleging that they would be at a disadvantage, south Indian states have reduced their fertility rates below replacement level, while the rate for states such as Bihar and Uttar Pradesh remains above the level, according to an IndiaSpend analysis of government data. The replacement rate of fertility is 2.1, the level at which a population exactly replaces itself from one generation to the next. In 2016, Tamil Nadu’s total fertility rate (TFR)–the number of children a woman will have in a lifetime–was the lowest among India’s large states at 1.6, and other south Indian states–Andhra Pradesh and Telangana (1.7), Kerala and Karnataka (1.8)–also have rates below the replacement level of fertility, according to the latest Sample Registration System data, under Office of the Registrar General & Census Commissioner, India. The national average TFR was 2.3. Bihar reported the worst TFR among the bigger states in India at 3.3 in 2016, followed by Uttar Pradesh (3.1). Madhya Pradesh (2.8) and Rajasthan (2.7), all north Indian states. The Terms of Reference (ToR) proposed to the 15th Finance Commission–which lays out the roadmap for revenue sharing between the Centre and states, and among states–suggest to take into account the 2011 census, instead of the 1971 census which was used earlier. The 14th Finance Commission used a weight of 17.5% for the 1971 census population, 10% for 2011 census population, 15% for area, 50% for fiscal discipline and 7.5% for forest cover. 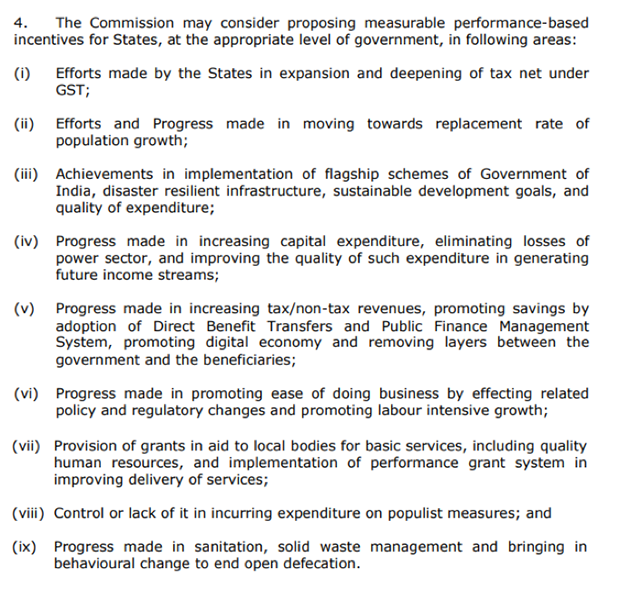 The ToR for 15th Finance Commission do not mention the allocation of weights to various parameters. The central government has proposed that the 15th Finance Commission incentivise states who have taken efforts to control population growth, Prime Minister Narendra Modi said in Chennai on April 12, 2018. “A state like Tamil Nadu, which has devoted a lot of effort, energy and resources towards population control would certainly benefit,” Modi said, in response to allegations made by southern states over discrimination in central funding, and biases towards certain states. Bihar’s TFR in 1981 was 5.7, which declined to 3.3 to 2016. In comparison, Tamil Nadu’s TFR declined by more than half from 3.4 in 1981 to 1.6 over the same period, indicating that the state was successful in implementing population control measures. 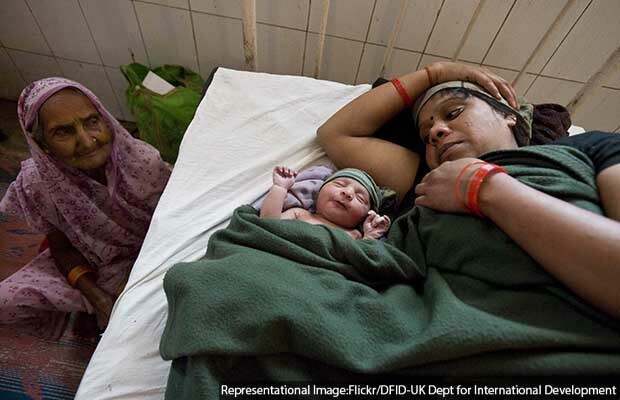 States in the north–Uttar Pradesh (3.1), Madhya Pradesh (2.8) and Rajasthan (2.7)–had higher TFR, all above the replacement level of fertility. The southern states allege that the new Finance Commission terms will benefit states in the north having larger populations, despite the former performing better on governance/development parameters such as population control over the years. “Southern states could potentially lose up to Rs 8,000 crore, if the ToR were implemented,” Thomas Isaac, Kerala’s finance minister said, the News Minute reported on April 24, 2018. However, states such as Maharashtra in the west and West Bengal in the east also have low TFRs–1.8 and 1.6 (same as Tamil Nadu), respectively. If the 14th Finance Commission had used the revised terms, Rs 1.25 lakh crore would have been redistributed, according to this March 10, 2018, article by V Bhaskar, former special chief secretary finance to the government of Andhra Pradesh, and former joint secretary Thirteenth Finance Commission, in the Economic & Political Weekly. Bhaskar calculated potential gains and losses to states based on the 2011 census using the share allocated under 14th Finance Commission. “All the five southern states would have been the biggest losers, along with West Bengal, Odisha, Assam and Punjab,” Bhaskar wrote in his article titled Challenges before the Fifteenth Finance Commission. Southern states that have been able to limit population growth perform better in terms of per capita income compared to states in the north. For instance, between 1991-2011, Kerala’s population rose 14% while its per capita income (at constant prices) increased 53 times (5,262%)–from Rs 1,826 in 1991-92 (base 1980-81) to Rs 97,912 (base 2011-12) in 2011-12. In comparison, while Rajasthan’s population increased by 56% over the same period, its per capita income increased only 32 times (3,172%) from Rs 1,755 in 1991-92 to Rs 57,427 in 2011-12. “Education is the best contraceptive pill,” Poonam Muttreja, executive director, Population Foundation of India, an advocacy working on family planning, had told IndiaSpend, reported on January 22, 2018. The TFR for women between 15-49 years is lower at 1.71 for women with more than 12 years of education compared with 3.06 to women with no education and 2.2 for all women. In 1971, the four south Indian states comprised 25% (135 million) of India’s population. By 2011, this figure was down to 21% (251 million). In comparison, the share of north Indian states–Uttar Pradesh, Bihar, Rajasthan and Madhya Pradesh–rose from 33% (182 million) in 1971 to 37% (445 million) in 2011. Between 1971-2011, the population growth of north Indian states has been higher compared to states in the south. For instance, Bihar’s population in 2011 was reported to be over 104 million, an increase of 147% from 42 million in 1971. Tamil Nadu, which had a similar population of 41 million in 1971, restricted its population rise to 75% over the same period to reach 72 million. The population of Rajasthan increased by 166% in 2011 over 1971, followed by Bihar (147%), Madhya Pradesh (142%) and Uttar Pradesh (138%). In comparison, Kerala reported a 56% increase, followed by Tamil Nadu (75%), Andhra Pradesh (94%) and Karnataka (109%) over the same period. The population is not the only parameter for providing incentive to states. The states will also be judged on other development indicators such as the implementation of goods and services tax, flagship schemes, sustainable development goals and promoting ease of doing business. In terms of ease of doing business, performance of states show mixed results. States such as Haryana, Chhattisgarh and Madhya Pradesh ranked among the top three in implementation of ease of doing business parameters as on April 17, 2018. Andhra Pradesh ranked fourth, Telangana sixth, and Rajasthan eighth above Karnataka (10). Similarly, Uttar Pradesh ranked 14, above Tamil Nadu (15) followed by Bihar (18) and Kerala (21).